Looking for a unique gift for the birth of a special little girl? 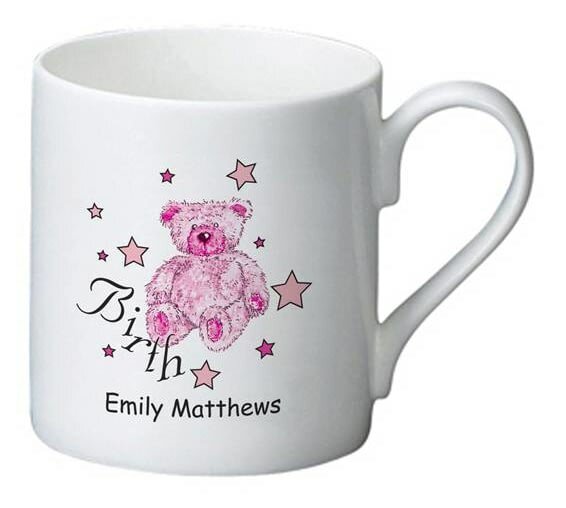 Pink stars and a cuddly pink teddy bear decorate one side of this cute mug, whilst your message to the recipient adorns the other, making this a bespoke gift for the special occasion. Whether it's put on display until the recipient is older, or used by Mum as a memento of the day, this personalised present will be kept for years to come. Kiln fired, this bespoke mug is also dishwasher safe. This round keepsake is a unique way for guests to give a special little girl something to cherish when she’s all grown up. A loving cup decorated with cute pink stars and a cuddly pink teddy makes a perfect gift for a little girl's christening day.